Tremendous turnout at the Statehouse in Concord for the press conference about HB302 and the opposition to the Northern Pass proposal. 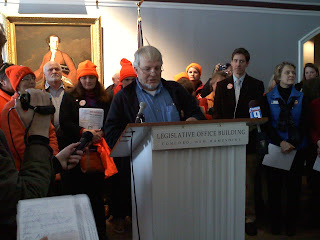 For an mp3 audio file of the press conference, featuring remarks by Jim O'Brien (Conservation NH), John Harrigan, Valerie Herres, John Amey and Jane Difley (Society for the Protection of New Hampshire Forests), click here. Conservation NH posted videos of the press conference here, here, and here.